What is it that keeps us in this unending to and fro, this endless swing from one extreme to the other? What is it that keeps us living in a state of parenthesis always expecting what is the next event to take place that will show once more the adversity or negativity of life? Have you ever thought why is it that we can’t have a world of perfection and continual joy and peace? After a lifetime of questioning ALL, this Life has smiled and unveiled Itself in Truth and Reality. It all seemed to have started at the beginning with the eating of the “apple”, the account that has given much to say through the centuries. But in reality it all has a simple lesson behind it. You either live and exist as the expression and essence of God that you are or you continually partake of a fruit that is produced from a tree of duality and recurrent judgment. This tree will take you into thought processes, evaluations, thinking, analysis, opinions and conclusions, all a product of a sense ruled mind that seems to know it all according to what is seen, heard, touched, smelled or tasted. Here we remain in that state of a continual whirlwind that will only produce struggle, strain, suffering, pain, instability, ups and downs and the like. It is never ending, a vicious circle similar to a cat trying to catch its tail. Meanwhile there is something Greater, something that goes beyond and transcends this dual life, this dilemma of controversy and adversity. When there was given a choice between two, life and death; the choice was between Life as the One and only substance that is All in All and the other alternative was death; death being the result of eating from the tree of the knowledge of good and evil, the dual judgment that comes and goes according to our senses. The “Life” was the One, the one that transcended this dimension of polarity and being thrown to and fro by the forces of its nature in the context of an unstable teeter totter. The choice of Life is the simple choice of the heart of a child that proceeds in all, out of his Being and spontaneity, allowing its nature and source to express Itself. The unlimited creative world of a child is what brings the fullness of joy and continual peace and tranquility that ultimately is “Who we are”. Others heard the voice of God announcing "This is my Beloved Son." I will destroy this Temple and raise it up again in 3 days, speaking of His Body. I will go to My Father and I will send to you a Comforter, (My Spirit) who will take what is mine and reveal it unto you. Only one was at the tomb ready. Mary Magdalen and Mary the Mother of Jesus "who kept all these things in her heart.". They all heard what Jesus said. Physically. With their flappy ears. But it didn't have meaning. For Mary the disciple who was by now fully awake spiritually, fully engaged with the words of Jesus and turned up at the Tomb after she had counted 3 days. why do we need salve? Our eyes are filled with snake venom. In Genesis 3 it says "then were the eyes of Adam and Eve opened....and they realised they were naked." God asks " who told you you were naked?" Let's abolish the carnal understanding of this phrase. This version reads that God was stupid in keeping Adam and Eve in the Dark about nakedness. As if He was secretly running some kind of nudist camp without telling Adam and Eve anything to the contrary. What was actually happening was a whole new world of shame now opened up. Like a gouge or gash in our spiritual environment and in poured the snakebite of shame into a world that had been completely devoid of it. Secondly, and relatedly, "Living as separate beings from God"....as selfpowered souls in our own right is what is meant by seeing EVIL. To believe there is an "independent existence" is to be powered by the same self for self inverted spirit of Satan himself. Satan isn't free himself. He is totally bound up in his self for self spirit with the wrath of God upon it. Outside of Christ we aren't free beings either as Satan lied to us....we are in fact caught up in Satan's spirit, Satan's walk, Satan's ways, Satan's fruit. Everything he sold us is bogus. But we have to now choose in a very costly way to see all this. Where the Spirit of the Lord is there is freedom. He has promised to lead us into all Truth. This is as Hebrews 4 says to pierce like adouble edged sword between soul and spirit. 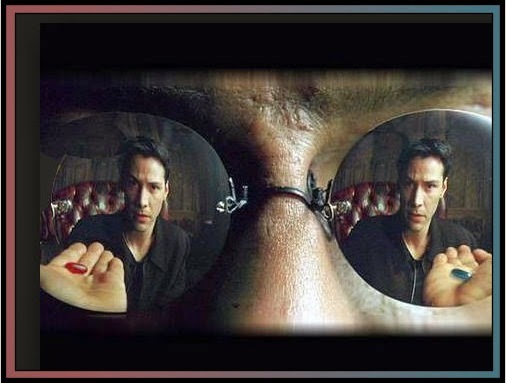 Every vestige of the hookup with the world, the flesh and the devil, which is one seamless linkup....has to be uncovered in us for us to ever walk out free from the MATRIX. Jesus said in the Upper Room...."Now is the Son of Man glorified. The devil has nothing (literally no landing places) in Me. 1 John 3:8 the one who practices sin is of the devil; for the devil [c]has sinned from the beginning. The Son of God appeared for this purpose, to destroy the works of the devil. We learned the life of faith from Abraham. This is like the evangelical discovery that "by grace you are saved, it is not according to works". We enter into a Blood-bought Covenant with Jesus our Saviour and God our Father. We learned to dig wells like Isaac. We learned to find the heavenly provisions of God by standing on faith. We rediscovered the world of the supernatural Presence of God as mediated to us through the experience of being baptised in the Spirit. What has been the charismatic realm. But to properly change our inner seeing and as Norman Grubb repeated all life is consciousness....for this inner seeing to change FULL TIME....we had to believe ON the concepts of Romans 6. We had to believe on the phrase also "As He is so are we in the world." WE CHOOSE TO SEE GOD IN EVERYTHING. Early steps were in the realms of praise. To praise the Lord even when everything "looked dire". To praise the Lord is to choose to acknowledge God in a bit of the Universe that appears like it is broken down...that He isn't sustaining that bit of it. Well we decide in our hearts that no matter how it looks He IS LORD. HE IS IN CHARGE.